I imagine I first heard of John Boorman's Hope and Glory through the movie trailers at the beginning of VHS tapes that my family rented and bought in the late 80s. In my memory, that trailer was ubiquitous, along with the one for Alan Parker's Come See the Paradise. Both films are about very different World War II "homefront" experiences, with the tone seemingly struck by Boorman's film coming across as particularly unusual to Young Me: possibly romantic, but also largely comic, and featuring a young English boy thanking Hitler for sending a plane to blow up his school. At the time, both before and after I actually saw Hope and Glory, I think I was under the impression that it was a very small film that went largely unnoticed by anyone outside of my family, so it was with some surprise that I recently learned it was nominated for a slew of Academy Awards, and big ones, too (any passion I had available for such matters was entirely in the service of Sean Connery winning for The Untouchables. You're welcome, Mr. Connery). And a strangely wistful, lightly and broadly comic remembrance of the London Blitz, is exactly what Hope and Glory (newly out on Blu-ray from Olive Films, by the way) is. The film is autobiographical, relating experiences that one has to assume are very close to Boorman's own childhood. In addition to directing, he also wrote the film, and serves as the uncredited narrator. It may be the most conventional film in Boorman's truly wild career -- how the same man could have also made Point Blank, Zardoz, Exorcist II: The Heretic, and Deliverance is utterly beyond me -- as well as one of his best. But of course, ultimately Hope and Glory ain't that conventional. It's a film of moments -- there is of course no plot, as such. Instead it's comprised of memories and experiences that depict daily life in a city that is regularly bombed by German war planes, and the weird acceptance that this is what things are like now. Hence the film's comedy, which, as an overarching tone, rarely wanes. The comedic moments can be a tad broad from time to time -- for example, a man getting his hand caught in a car door, and the driver driving what seems to be a mile before realizing the trapped man isn't merely joking around -- but that this is the tone that Boorman chose is what matters most. That he never nudges you to notice that this is what he's doing is more important still. 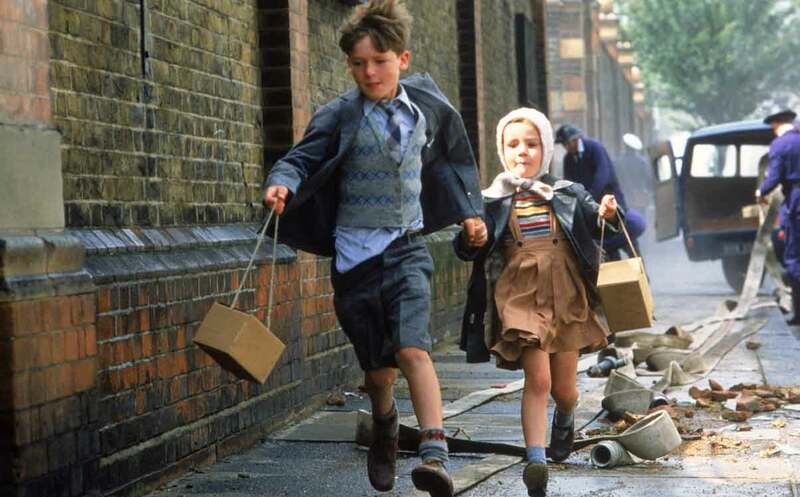 The film is mostly about kids, more specifically Sebastian Rice-Edwards as Bill, who's about twelve, and who lives with his mom (Sarah Miles), older sister (Sammi Davis), and younger sister (Geraldine Muir), after his father (David Hayman) signs up and goes off to war. And things go on as usual. Childhood is shown to be as funny and as absurd as most of us remember it to be, the difference being that all this normal, silly, stupid kids' stuff is happening in the rubble of their neighbors' exploded homes. Boorman also seems to want Hope and Glory to call to mind the heightened reality of the classic films from that time. This would explain Sarah Miles's performance, or parts of it anyway, and could also relate to the subject of memory that movies of this sort must engage with on some level, and which Boorman appears to be engaging with more directly and more slyly than most. It's impossible for me to know, of course, but Hope and Glory is full of small moments that my inclination is to believe are specific memories that Boorman carried with him for the almost fifty years between the Blitz and finally rolling camera on this very movie. My favorite is a scene of people gathering outside to watch a dogfight, which is so high in the sky that Bill complains he can't see what's going on, while beside him his mother guilelessly waves, presumably, at the British pilot. In another, a young girl stands outside of her freshly bombed home while her school friends gossip in front of her, at full volume, that her mother was killed. At one point, Boorman cuts from a medium shot of the environment to a medium close-up of the girl as she puffs out an exasperated breath. She's not only grieving; she's also just kind of fed up. In closing, I'd like to mention Sammi Davis, who, speaking of ubiquity, seemed to be everywhere in movies when I was a kid. However, when I look at her filmography it looks as though I've only this, A Prayer for the Dying, Mona Lisa, and a few others. In any case, she leapt out at me at the time. Her look and general vibe were not typical in movies, but she did find herself working with directors like Boorman, Neil Jordan, and Ken Russell who were not overly concerned with convention. Such directors are themselves not usual, which may explain why she retired from acting in 2008 (I've learned she's a photographer now). She had a real presence, she was effortlessly memorable, and she brings out a certain kind of cinephile nostalgia. Revisiting Hope and Glory this past weekend, I was happy to see her again.